I’ve sewn many Shwin Designs patterns before, but they’ve all been for my girls. 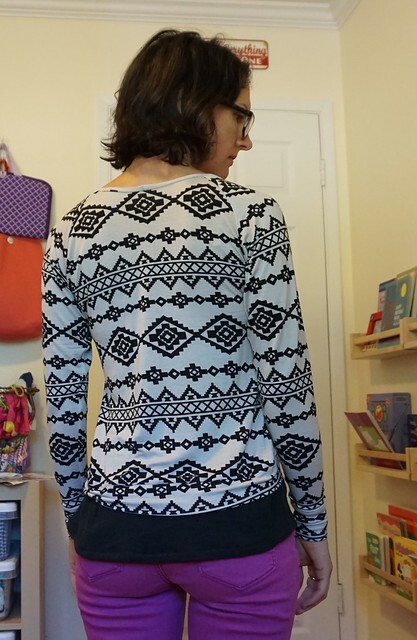 I’ve never tried any of her ladies’ patterns before, so when she was calling for testers for her Sky Raglan top, I thought it would be a nice opportunity to test how her sizing fits on me! I must be honest, this isn’t really my style of top. I do layer clothing, but typically in the traditional sense, you know, cardigan over top. The Sky Raglan is a knit raglan over a faux button down top (there are no buttons, just the look of a shirt front and back). The fabric requirements call for thinner knits and thin woven fabrics, think rayon jerseys and voiles. I selected a knit that Girl Charlee snuck into my order for free (thanks Girl Charlee! ), a thin, stretchy fashion knit, and for my faux shirt pieces, a crinkly woven fabric. It’s basically all I had that coordinated in my stash, surprisingly enough. My measurements put me in the XXS size (except for my waist which really wasn’t a big deal because it’s a loose top), so I made no pattern alterations. The construction is very simple, and the instructions were clear. She did add instructions on lengthening the top in the final version. 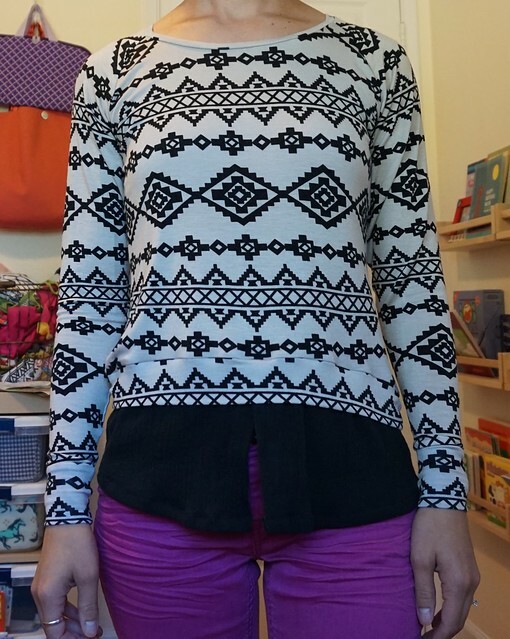 The pattern is supposed to be a bit of a crop top (the knit portion), but many of the testers wanted it longer. The knit portion has a high-low hemline too which works for the layered look. I’m really happy with the way it turned out, even with the awful black crinkly fabric. I’m definitely going to make more for myself now that I know it fits and sews together easily. I saw some super cute tester versions too, always good for some inspiration! I think the only thing I would change next time is to make the faux shirt back longer. It just wanted to sit on top of my derriere instead of fall over it which gave it an awkward look from the side. You can’t see it above since I’ve pulled it down, but pretty much just wanted to rest on my bottom the rest of the time. The Sky Raglan is on sale for $7, and it coincides with her release of the Glass Petal (ladies version of the Glass Onion pattern). 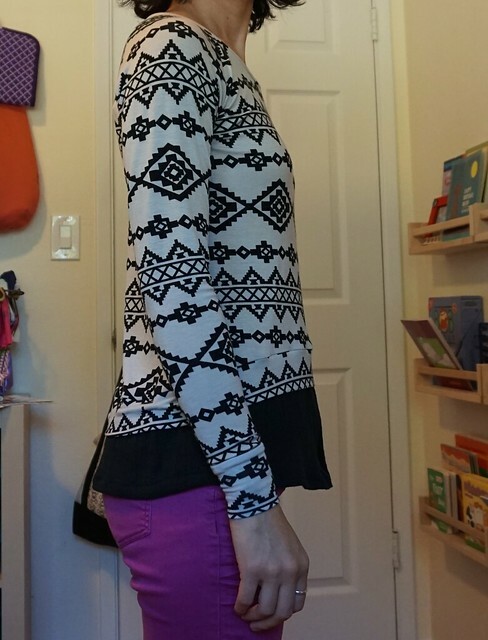 I have to say overall I was surprised by how much I like this top and the fit. I’ll be sharing some more versions shortly too (I finally ordered a dress form, so no more trying to take pics of myself)! Have you ever sewn up something you thought would be alright and ended up super awesome? Nice make, but I do hope you’ll use your dress form for sewing and model your makes yourself. I rarely bother with posts with dress forms as models, real, live persons are a gazillion times better. Doesn’t matter if you think the photos are awkward, they’re still loads better than a photo of a dead dress form. So, keep on modeling. Keep it real. I completely agree, and thank you for letting me know! I promise I will include some of myself too 🙂 And “dead dress form” made me laugh! I feel like I look like a zombie most of the time!!! Previous PostPrevious Get to the Point! Boxwood Joggers Yeah!